My Domestic Monastery: Why the Eucharist Matters [for Families] Day 2 - What is that Baby Doing at Adoration?! 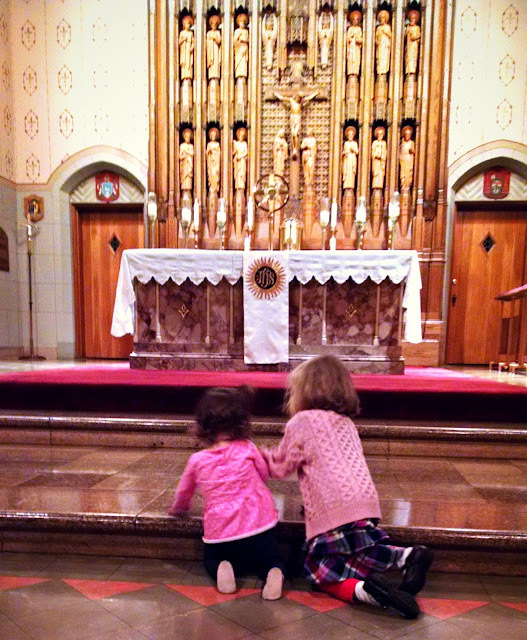 Why the Eucharist Matters [for Families] Day 2 - What is that Baby Doing at Adoration?! I don't know what I was thinking, but for some reason, back at the Parish ministry fair, I signed our family up for a weekly adoration time. Now don't get me wrong - the girls have been to adoration before. They both love Jesus in the Eucharist, and blow him copious cute little kisses. But our adoration time is usually limited to...oh, about five minutes. If we're feeling ambitious. Sometimes it'll go beyond that, but not usually. Suddenly, though, we were stuck with this "family" adoration time in our weekly schedule. Andrew likes going to adoration. I like going to adoration. But wrangling our two little stinkers during that time? Didn't sound very prayerful. I'm going to preface the rest of this story but reassuring you that God knew what He was doing. We happen to share an adoration time with some of the sweetest ladies ever, who are in love with and entertained by our girls. That makes the whole experience much easier! 6:01 p.m. Arrive a minute late. 6:02 p.m. Release the girls from their coats. Maria promptly crawls to the altar. 6:03 p.m. Maria tries to test out her new stair scaling skills on the altar steps. When told she is supposed to stay put, she either gets upset, or sweetly smiles and blows Jesus kisses (presumably to trick me into thinking she isn't up to mischief). 6:05 p.m. Therese joins Maria and convinces her to come over to the side altar of Mary instead, and whispers, "That's your patron saint Ria!" 6:06 p.m. Ria is unimpressed. Looks for different steps to climb. 6:10 p.m. I try to direct Maria over to the nice, soft carpeted area by the Baptismal font. She kind of buys it, but tries to figure out if there's anything she can knock over or bang on. Therese runs over to the book in the corner and says, "Look Mommy! This is the names of all the people who have died." Maria notices the stained glass art hanging in the corner (of a Baptismal font and the Holy Spirit as a dove) and starts pointing and vocalizing in excitement. Loudly. She is in a major picture loving stage. 6:13 p.m. Maria is getting bored, so I hold her hands so she can practice walking down the aisle to the back of the church. 6:15 p.m. We are nowhere near the back of the church, but all of a sudden Therese says, "Mommy! I have to go potty!" I scoop up Miss Slow Walker, and we rush to the back of the Church. 6:20 p.m. The potty break is done, and Maria is really starting to get wiggly. I try to show her some of the pictures and statues in the church and this briefly holds her attention. I'm ready to trade her off with Andrew, though, so I set her down and let her crawl down the center aisle to the front of the church (see picture). 6:23 p.m. Stop Maria from scaling the altar steps. She blows Jesus a few more kisses. 6:25 p.m. Therese tells Andrew she has to go potty again, so they make their way back to the bathroom, and Maria and I stay in the pew. It's getting close to her bedtime, so I try to nurse her so that I can keep her in one spot. She's not buying it. We play the chase-me-to-the-altar-steps-mom "game" again. 6:28 p.m. Andrew and Therese get back from the bathroom. Andrew tries to wrangle Maria a bit, but it's the end of the evening and she only has eyes for me. 6:29 p.m. We start getting the girls' coats on. The other women at adoration leave. Andrew gives them their goodnight blessing, and we decide he'll stay until someone else arrives, so that Jesus isn't alone. Get the picture? We're not sitting quietly in the pew gazing at Jesus the whole time. So why go? I'll be honest, there are some weeks when I can't bear the thought of wrangling the girls for that half hour, or they haven't finished their dinners, and so one of us stays home with the girls and the other goes alone. But many weeks, we do go. Why? Because adoration isn't just about a personal happy hour with Jesus. Yes, sometimes that's what it is, but often not. And even if it's not, that time with Jesus has infinite value. Andrew and I make sure we each have time to pray alone. 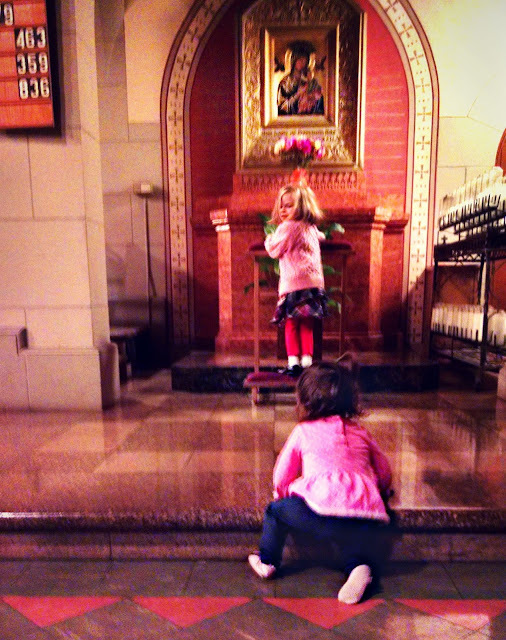 So, when we go to adoration as a family, we're not trying to squeeze in personal prayer time. We're realistic, and we don't make that our goal. Our goal is just to be there, and to bring our girls to spend time with Jesus. When you spend time with Jesus, He changes you. Yes, it's good if you can bring your "A" game to adoration, but even if you're distracted and literally walking circles around the church, it's still the very best use of your time. Because even then - and maybe especially then - He works on you. He changes your heart. He helps you know His love. And He helps your family grow in love. Part of having small children is accepting that it will be years before you have another uninterrupted conversation with your family and friends (at least if there are little ones in the room). That's just par for the course. If you have good family and friends (and we do!) then they love you and they love your little ones so much, and they don't care - they just want to spend time with you. Why would Jesus be any different? Thanks for writing this series. It does matter! We go to mass every week as a family but I need encouragement to go to Daily Mass. I need a lot of encouragement to bring the kids with me to Daily Mass. Our church just opened a perpetual adoration chapel this week. Jon and I are so excited. Our parish has been so receptive to us bring the littles to daily Mass and hopefully they will feel the same about adoration. ;) Jon often brings Michael to benediction on Wednesdays (the adoration day before perpetual started) and Michael just loves it.